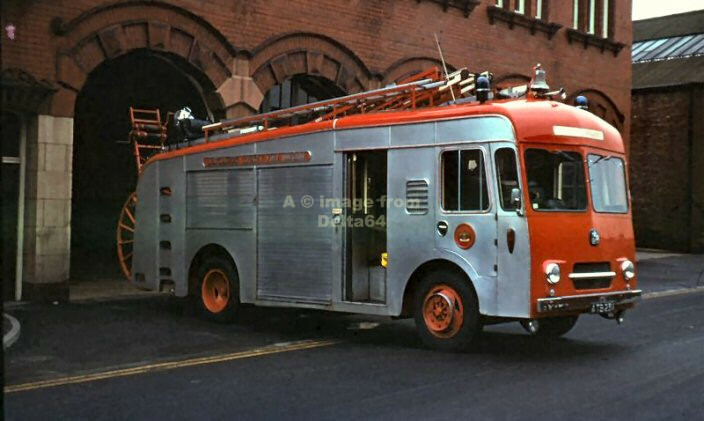 Leigh was another former Lancashire County Fire Station, absorbed into Greater Manchester in 1974. 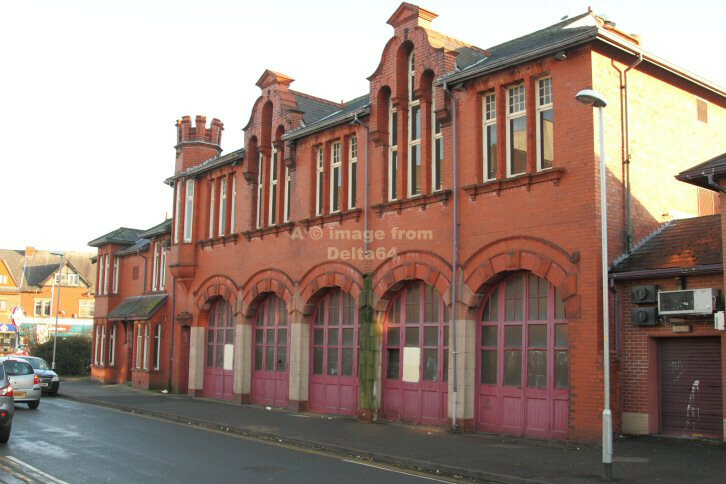 Leigh's first fire station was on Railway Road. 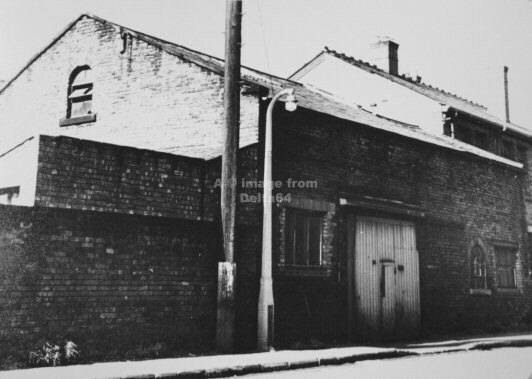 It was replaced by the building above in Gas Street which was closed in 1906/07. 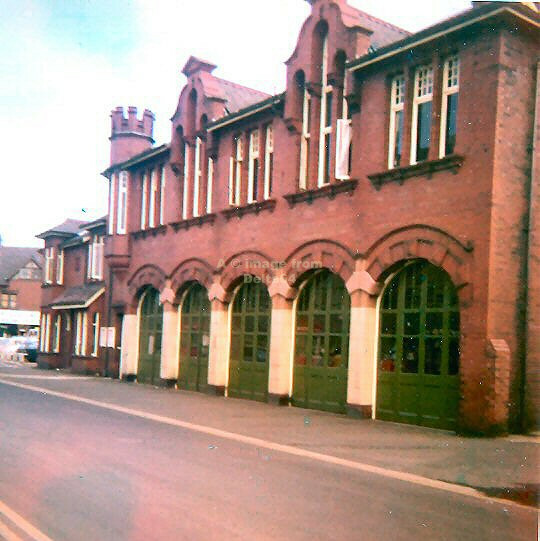 The third fire station was built on Windermere Road 1907 and was photographed c.1971. Nowadays it forms part of the Bowling Alley. As noted above, the Windermere Road Station is used as a Bowling Alley, but looked almost unchanged at the front when photographed 19 January 2011. 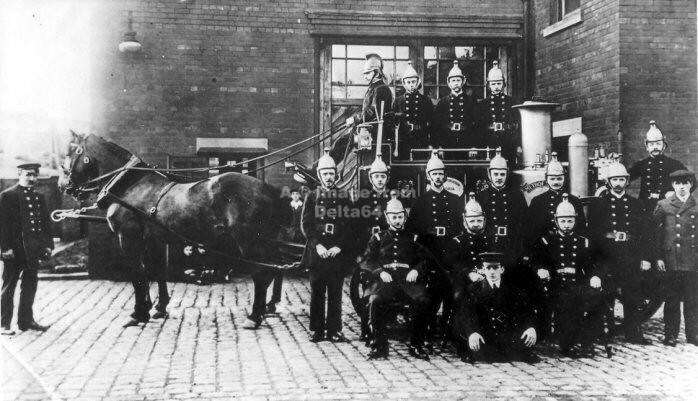 The Leigh Local Authority Steamer Fire Engine and crew. 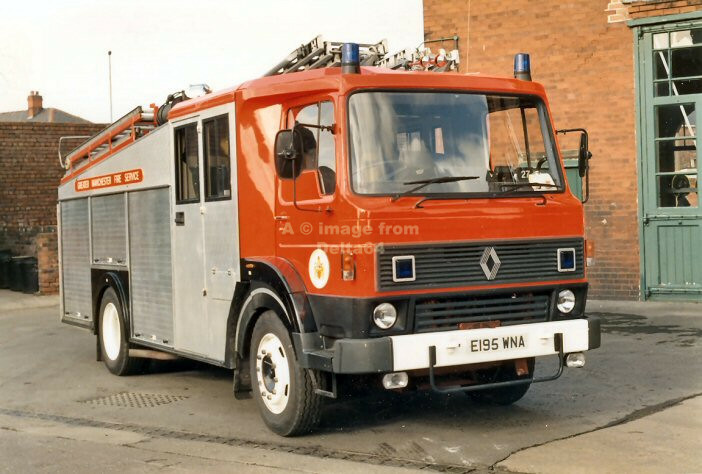 Leyland FE Pump TB8200 dates back to 1922. 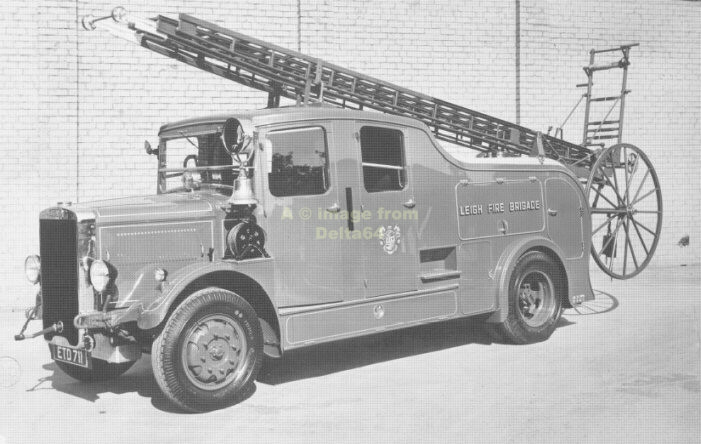 Leyland FK8 ETD711 from 1939 which subsequently passed to Lancashire County Fire Brigade. 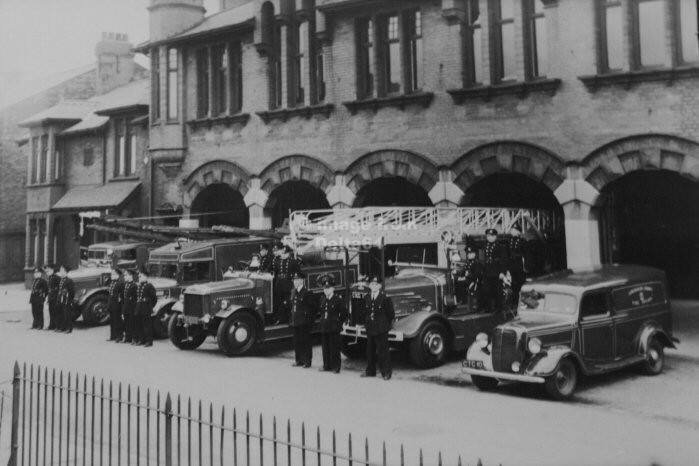 This interesting line up at Leigh dates back to 1949. 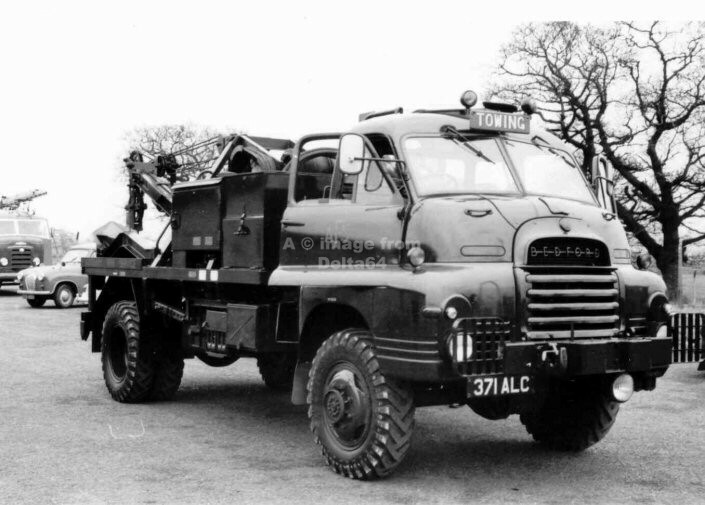 Bedford Recovery Vehicle 371ALC was based at Leigh during AFS days. 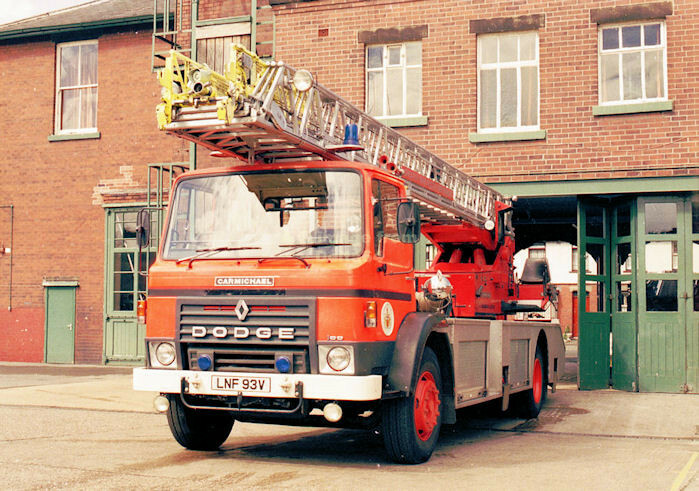 After the AFS disbanded, it passed to Cheshire County Workshops where it remained until 1978. 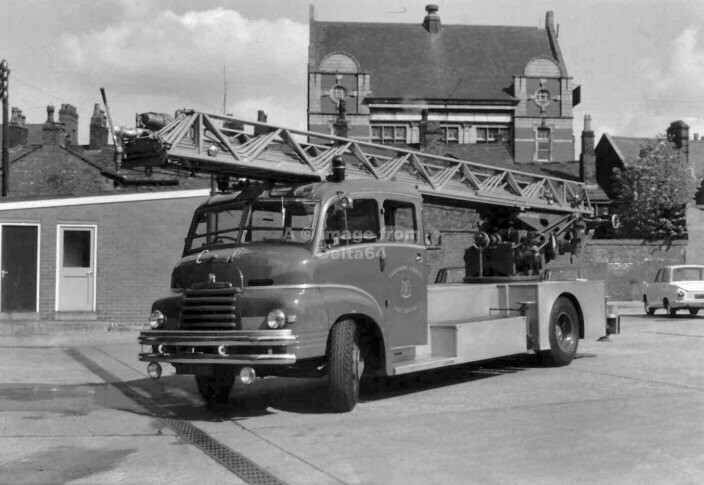 Two pictures of Bedford Turntable Ladder VTJ416 which dates back to1955. 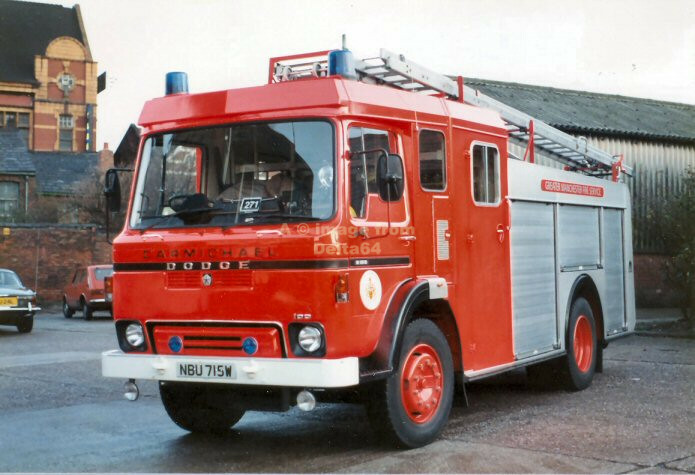 It was sold to the Isle of Wight in 1966. 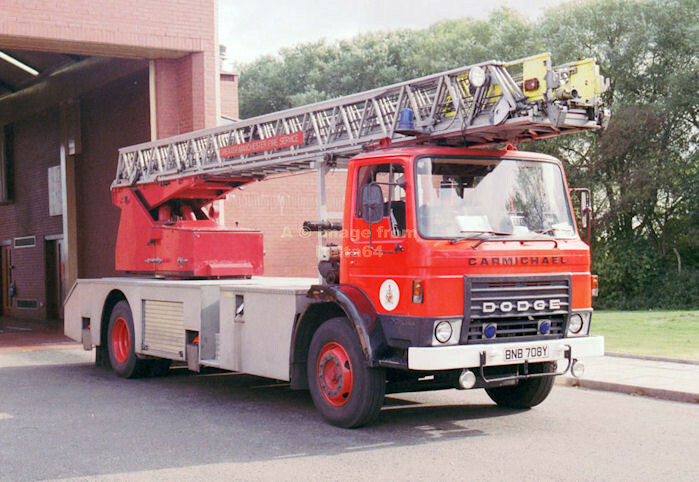 After Fire Brigade use VTJ416 saw further service with Rentokil. 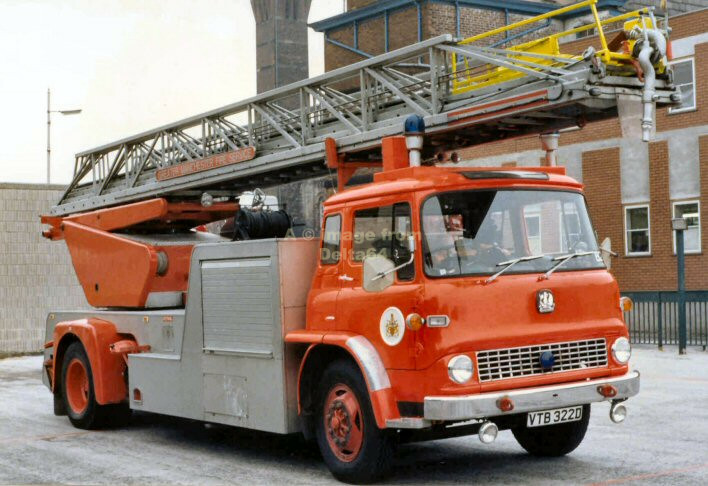 Only 10 pumps carried the attractive Busmar bodywork as exemplified by ATB231A seen at the front of the station. 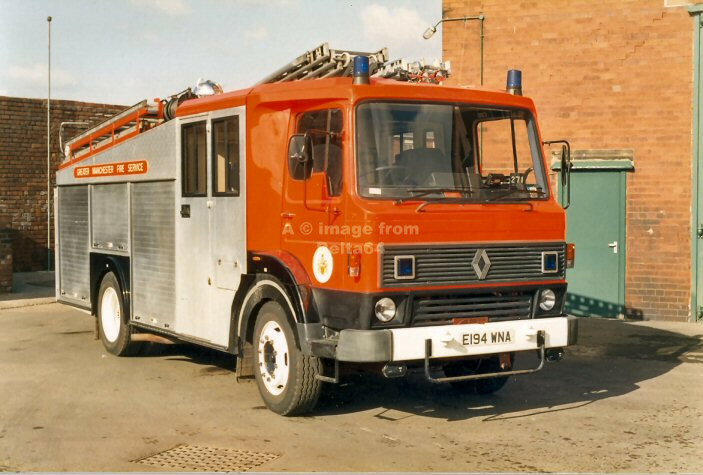 With chrome around the windscreens, ATB232A was seen in the station yard. 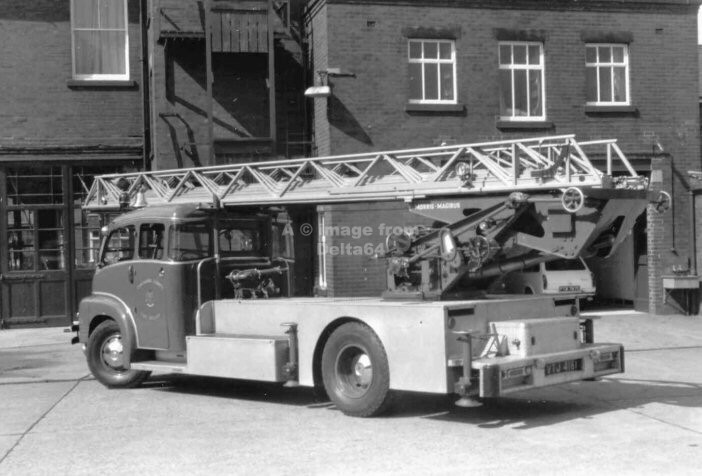 Another shot of ATB232A showing the 'working' end. 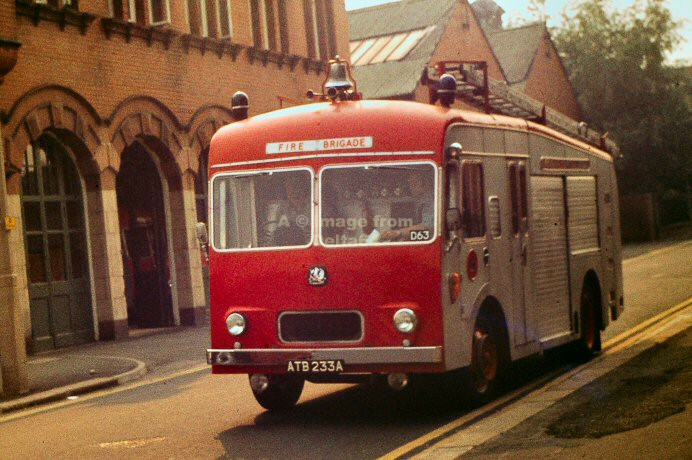 Completing the line up of Busmar bodied appliances, ATB233A was seen leaving the station, 25 August 1973. Bedford TL VTB322D seen with the characteristic 'yellow head', a reminder of Lancashire County days. 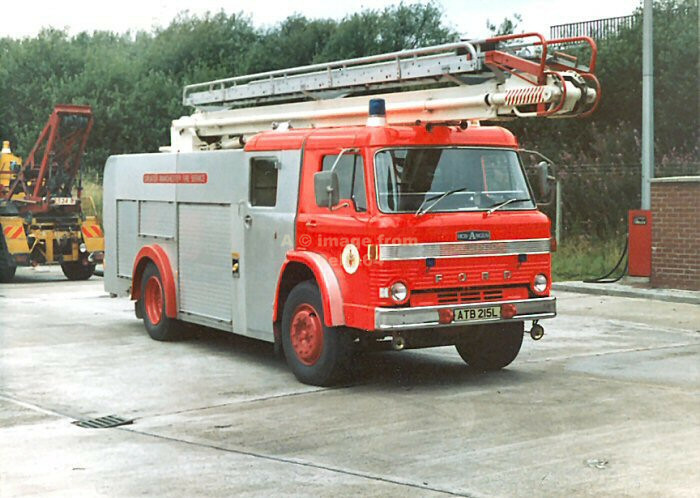 TL VTB322D was delivered to Lancashire County in 1966, presumably as a replacement for VTJ416 above. first Manchester Lord Mayor's Parade. 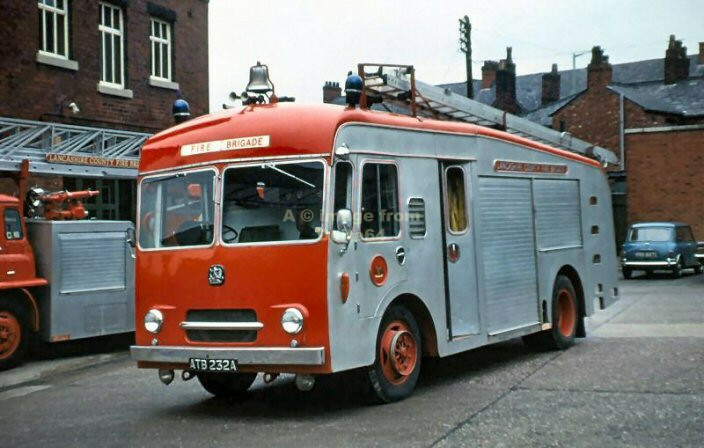 Ford Simonitor ATB215L was seen in its early days when part of the Lancashire County fleet. 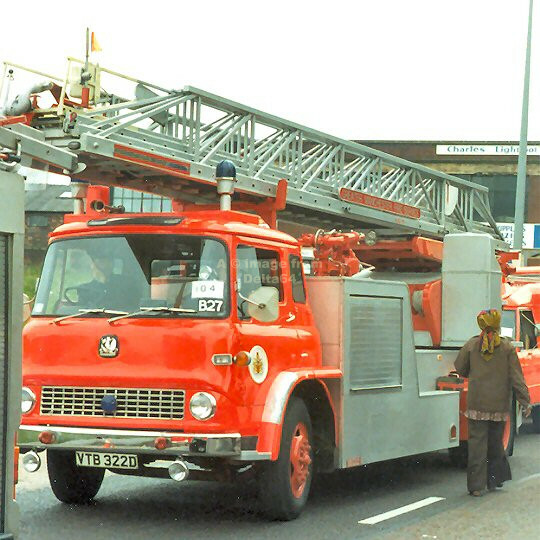 Escape Monitor ATB215L after it passed to GMC in 1974. 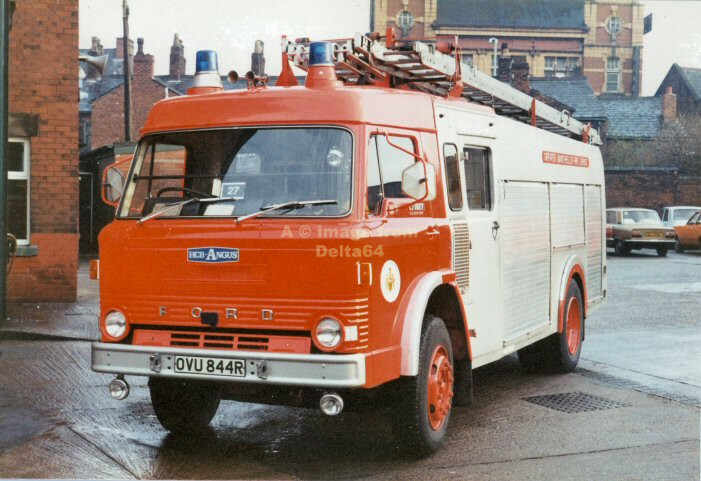 Ford OVU844R was seen in the familiar surroundings of teh Windermere Road Station. 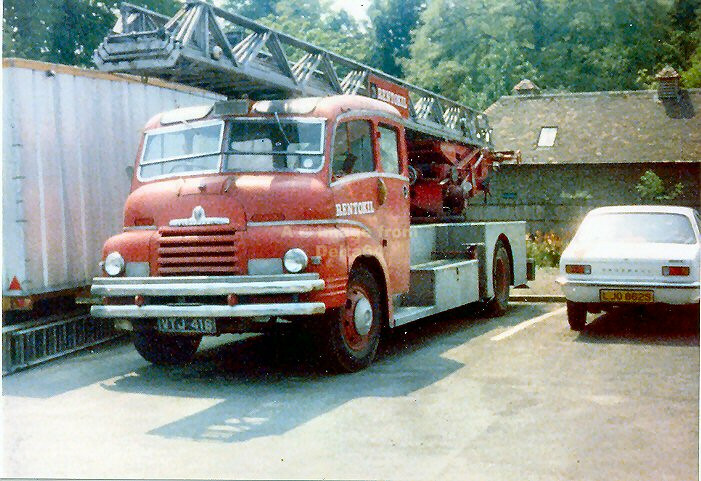 Dodge TL LNF93V was seen in the yard at Windermere Road. Another shot of Dodge TL LNF93V with a modified front end. 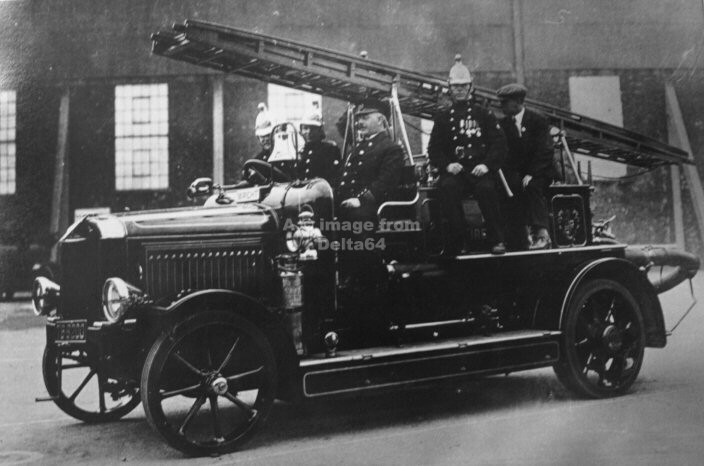 Leigh was one of the first stations in GMC to receive Dodge pumping appliances. 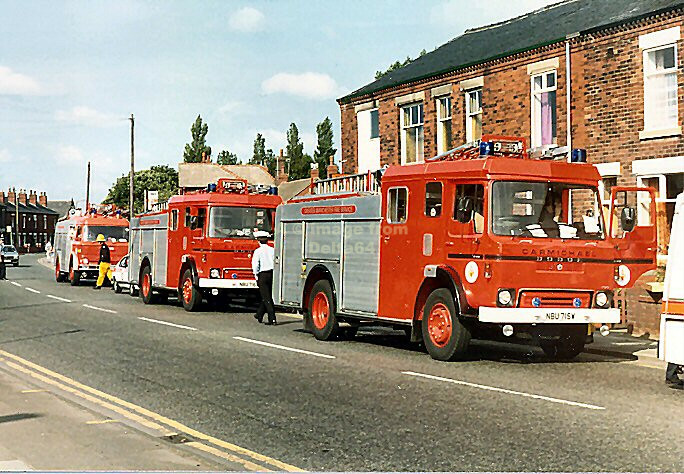 a house fire - persons reported - in Lowton in 1981. 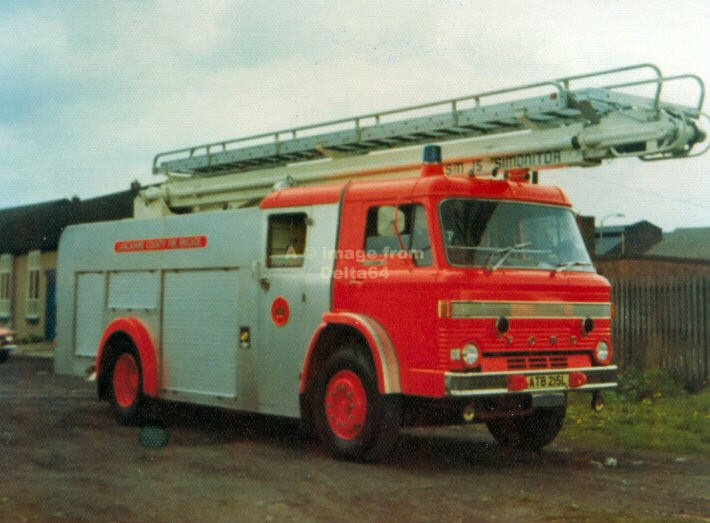 This picture of Dodge NBU715W was taken at the rear of the Windermere Road Station. 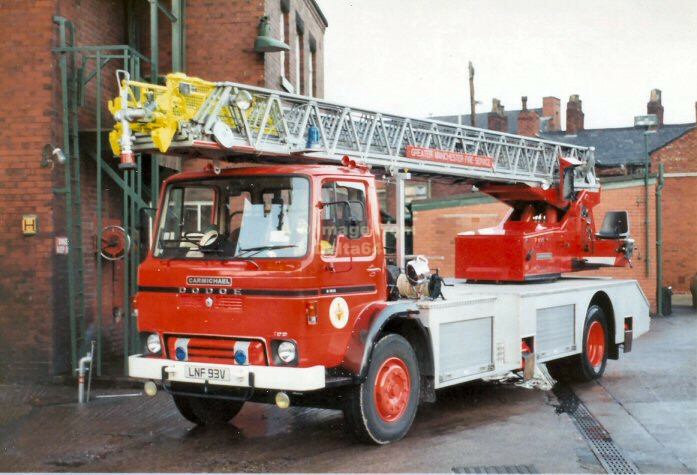 Sister appliance NBU716W truning out of the old station compares with those of the Bedfords above. 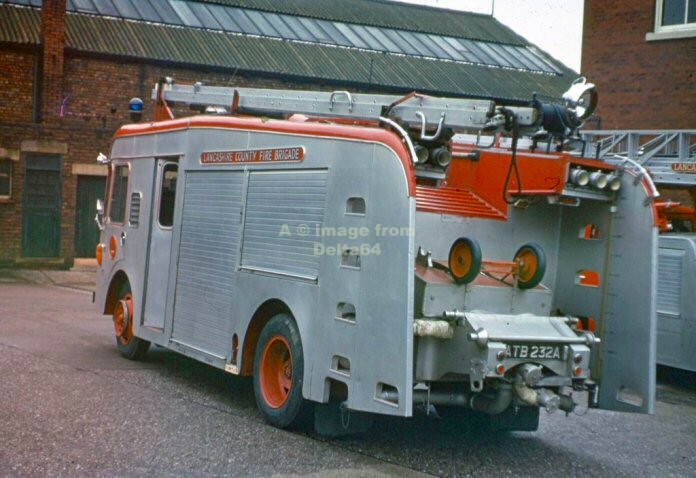 Dodge TL BNB708Y, whilst never actually allocated here, was probably running as a reserve. 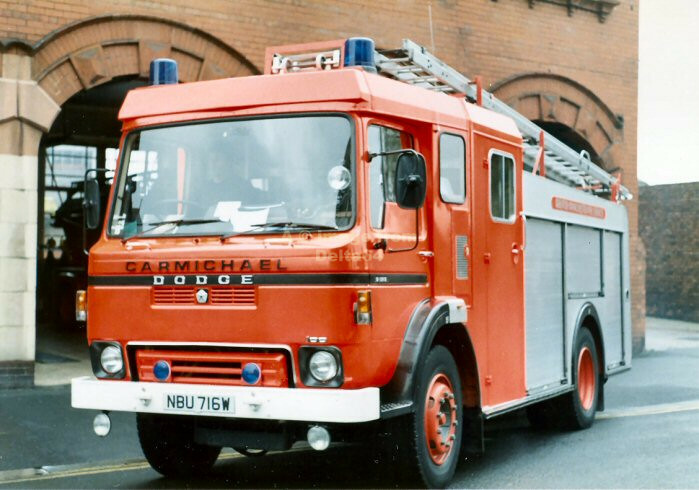 Dodge E194WNA actually replaced a Dennis RS that had transferred in from Stalybridge. 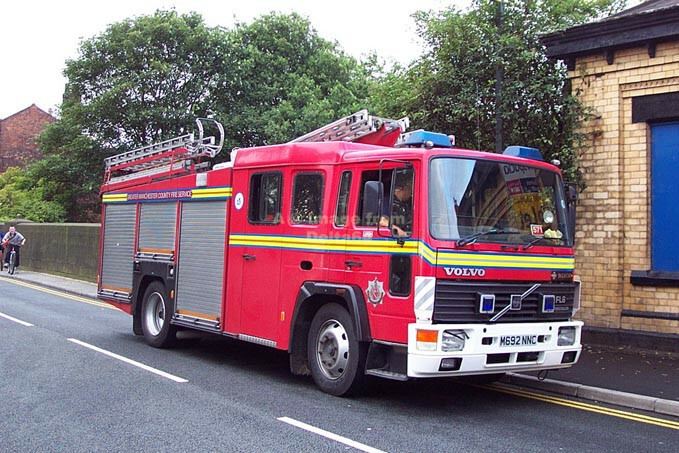 Part of the Training Fleet, Volvo M691NNC is also used by the YFF scheme at Farnworth, where it was seen 25 March 2007. 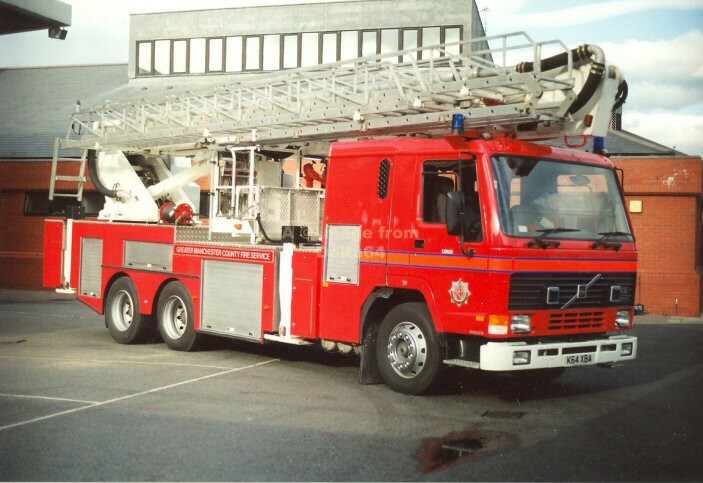 Numerically the first two Volvo FL6 pumps in the fleet were allocated to Leigh. 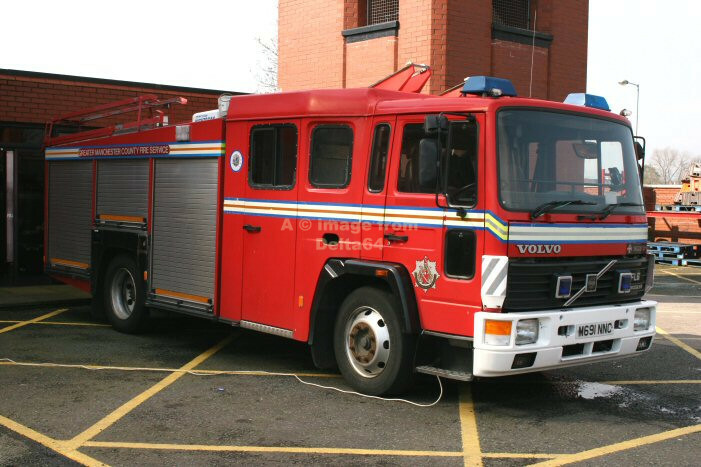 M692NNC was seen in Orrell after a large fire, 12 August 2002. 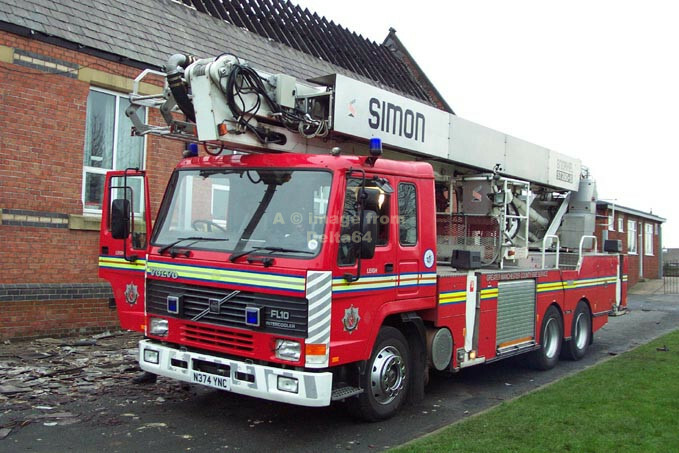 Volvo FL10 ALP N374YNC was seen at a school fire in Hindley Green, 13 February 2004. 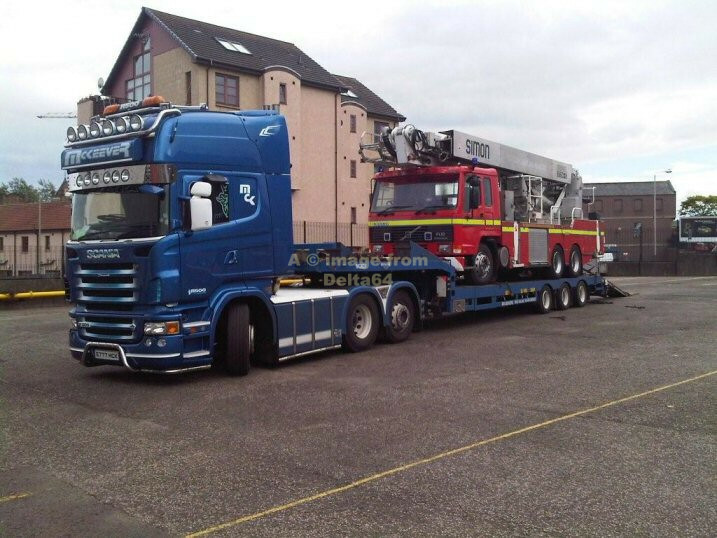 After service with GMC, Volvo ALP N374YNC passed to Tayside Fire and Rescue Serivce where it was seen 21 August 2008. 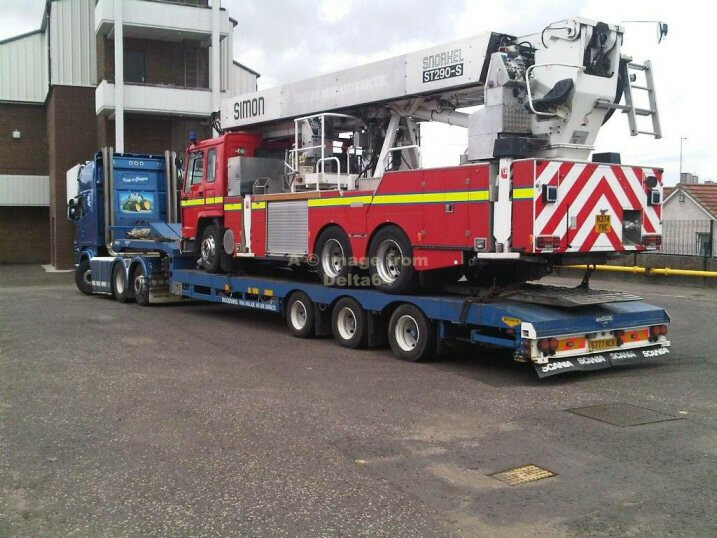 Volvo ALP N374YNC was sold again in 2010, and in September was on an even longer journey this time, to Buenos Aires in Argentina. 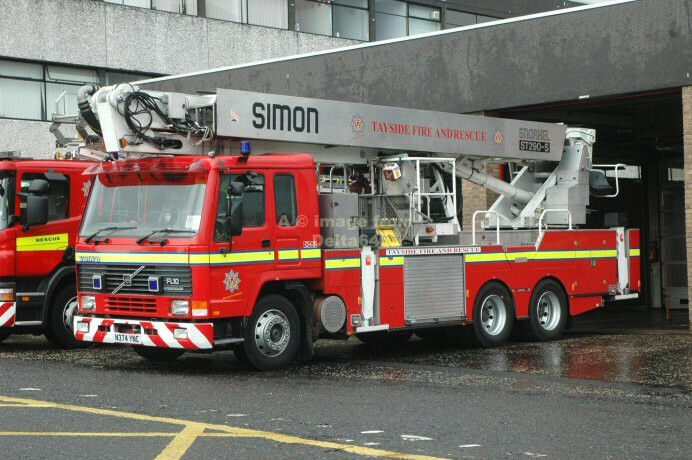 Volvo FLH MW52UDV was seen turning out from the fire station, 27 August 2010. 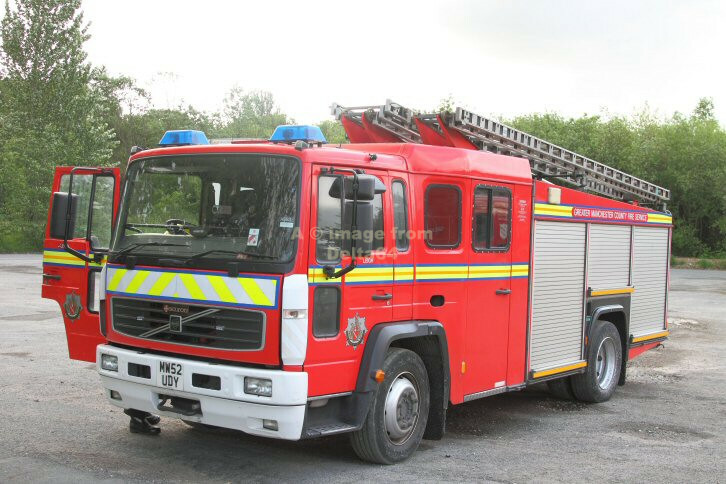 Volvo MW52UDY was seen on relief duties following an 8 pump fire in Bryn, 19 May 2011. 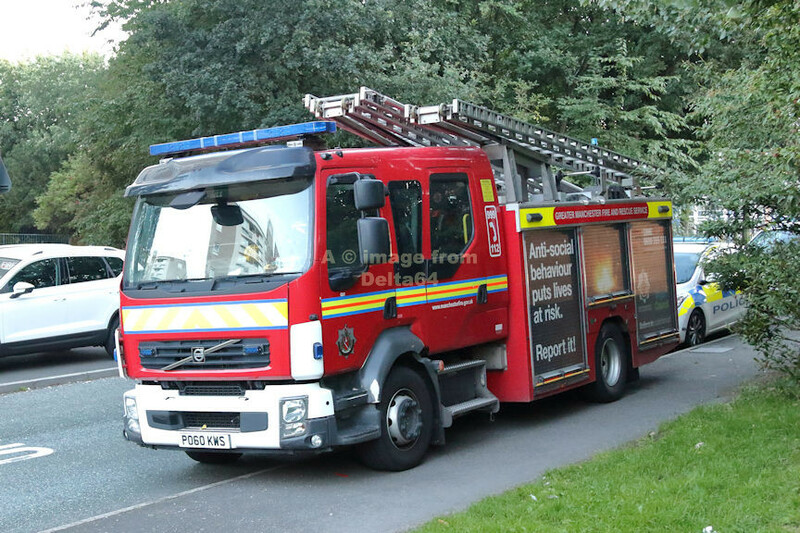 Volvo TRU PN05EHD was seen at an incident Withington, 26 April 2017. 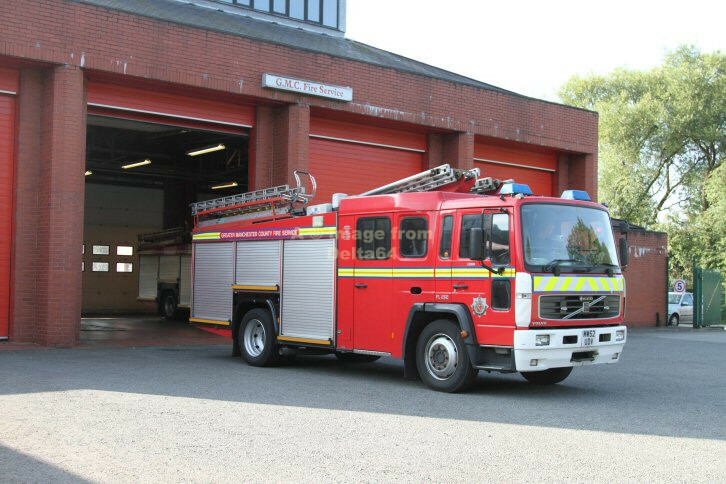 This appliance supports USAR. 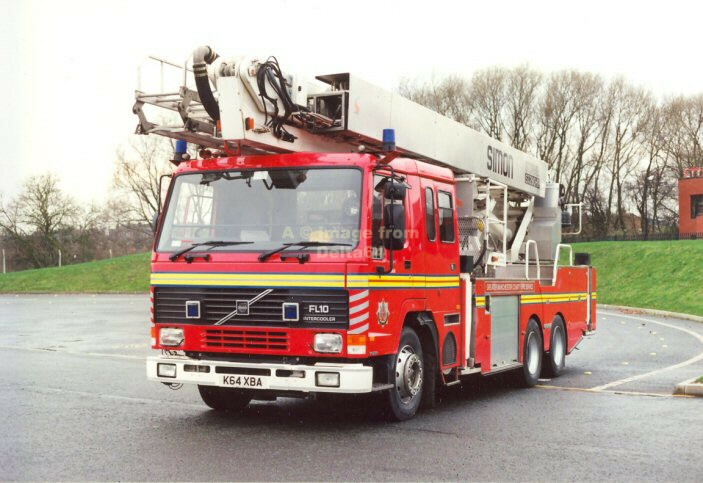 It carries just the 9m ladder with other equipment stored on the roof. 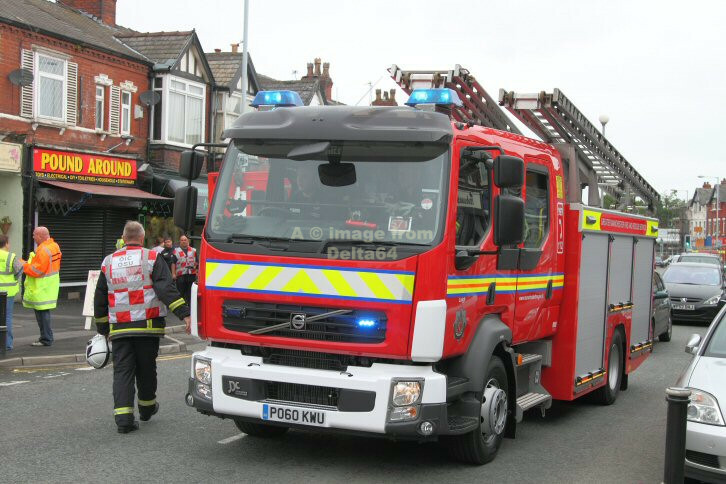 ERU MV54AYU was seen at a 16 pump fire in Withington, 26 April 2017. Volvo PO60KWS was seen in Scholes, Wigan, 25 August 2018. Into service 24 June 2011, PO60KWU was seen at an incident in North Reddish near Stockport, 25 June 2011.